I am not ready, but here we go! I am not ready! The other night I attended the middle school orientation for the parents of incoming sixth graders at one of the local middle schools. The school itself is beautiful and huge. It was a bit intimidating to me. The high school I attended was tiny in comparison. It scares me a little to think of my baby walking the halls in September. In my mind, she is still the little baby who loved to be held and cuddled. Of course she is no longer that baby, she is a beautiful, intelligent, strong and confident young girl who is not only ready for the next stage but excited for it to come. The process of our 6 elementary schools folding into 3 middle schools is actually a very well planned out chain of events that started a few weeks ago. A counselor visited the elementary school and talked to the kids followed a week later by the kids boarding a bus for a tour of their soon to be new school. Last week, the parents met with the Principal and in August there is a several day program in which the kids get used to the school, lockers and all of the wonderfully High School like world that our Middle school will provide. When I went to school (way back when) I went to the same building for 8 years. There are more kids in the elementary school that Meg attends that were in my entire school and the middle school has almost 200 more kids that. I am finding myself a bit overwhelmed but like I stated earlier Megan is so excited. She has already been studying the list of clubs and is putting thought into how to decorate her locker. 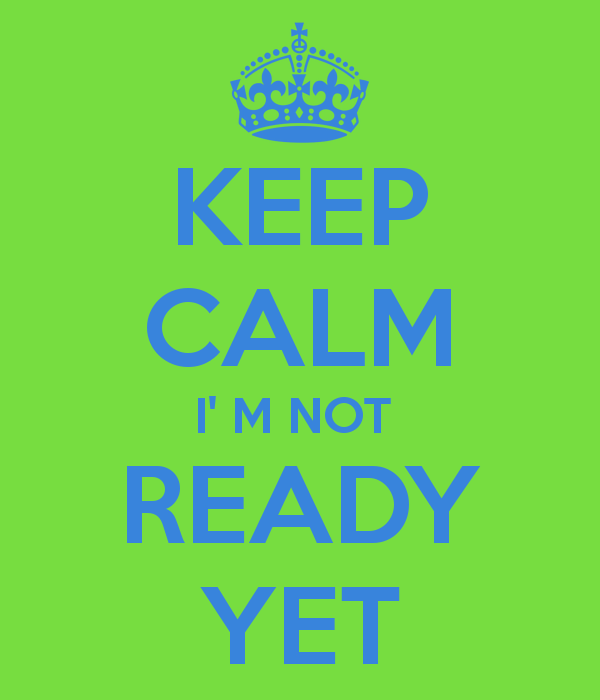 I am not ready! Every night before I go to bed, I look in on the girls and stand for a minute and watch them sleep. Often I kiss a cheek or the top of a head and smile. I think of just how proud of them I am. I can not imagine a life without my girls, my family. Lately, when looking at Megan I wonder when it happened. When did that shy, timid little girl become the young lady who is about to become a middle schooler and test for her black belt in karate. It all happens too fast. So here we sit ready to embark on another first, another new adventure. I will be there to celebrate the wins and to dry the tears. I will hide my unease because this is part of life, the necessary part where mommy can not control everything, the part where my little girl must take steps to build her future. I may not be ready but my wonderful, brilliant beautiful daughter is so I will kick and scream,(quietly behind a door) and probably shed a tear or two but away we go. Ready or not, I will be with you every step of the way! I can not believe that school will be starting in 2 weeks. It has been a very hectic summer for us and has seemed way too short! Megan is heading into 5th grade and my little Madison will be in 2nd. When did it happen? When did my babies get so big? It seems like just yesterday that I packed Meg up for her first day at Pre-K. She was such a shy little thing that even though I was home, we sent her for a few hours a day just to be around other kids. 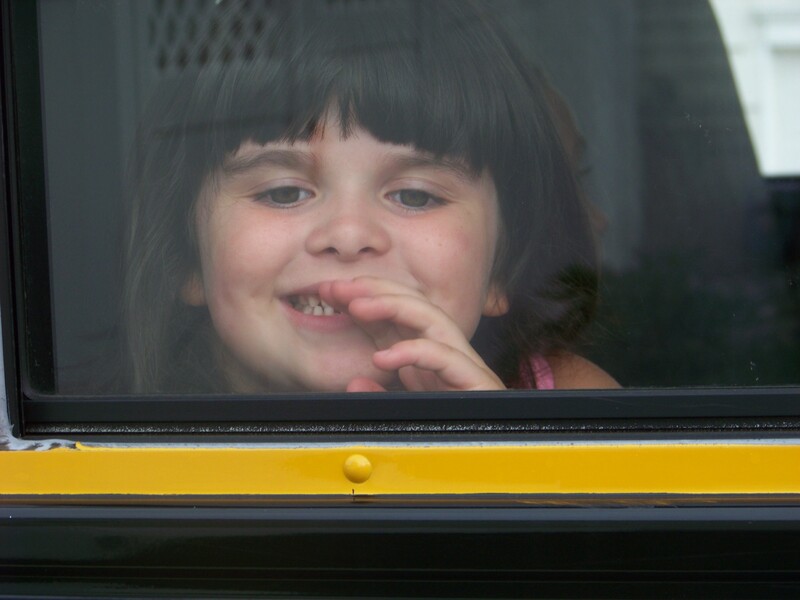 I remember the first day of Kindergarten and the first time I watched the bus drive away. I was so worried about her, would she adjust and fit in? Of course she did just fine. Before each of these first days I sent her to school with a kiss in each hand. A little something to carry from me just incase she needed them throughout the day. 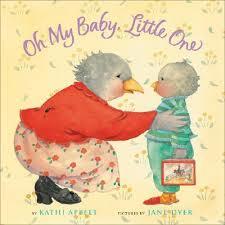 There is an adorable little book called O My Baby Little One that we have had since Megan was a baby. It is about a little bird who feels sad as he heads off to school. His Mom is also sad and explains to him that the love they share will stay with them both everywhere they go even when apart. I have read this the night before the first day of school since Megan’s first day at Pre-K. With Megan turning 10 just the other day I was a little worried that just maybe my girls would not be as interested in our “ritual”. The other night we were gathering school supplies together and I asked if either of them had seen the book, (fully knowing exactly where it was :-). Before even allowing them to answer I asked if we would be reading it again this year. The reaction made me so happy. Both girls looked at me as if it was a crazy question and almost in unison answered “of course”. It made me feel good, “our thing” is just as important to them as it is to me. I realize that I am raising two girls who in no time at all will both be teenagers. I know that there will come a time when everything that my husband and I do will be found to be the most embarrassing, annoying things in the world. I understand and together we will all make it through but for now I will enjoy every moment I can get where they still allow me to snuggle up and just hold on to them. So Megan and Madison, as the first day of school draws near, when I ask for your hands, do me a favor and just accept that I am so very proud of you both. Accept that I love the strong and confident young ladies you are becoming. Accept that in my heart you will always be my babies so put out your hands and please allow me to send a kiss in each and know that I will always be with you and that I love you both so very much!